So, Marvel Studios could already use the image of the Watchers, but not the Uatu name? Yup. The Watchers (a group of unnamed characters) appeared in GOTG2. But the specific Watcher, Uatu is currently under the Fox banner. Same deal with the Skrulls (who will appear in Captain Marvel) but not specifically Super Skrull. Of course, the "Ultimate" skrulls - the Chitauri - have already appeared in "The Avengers." But we ALL know what we want, really. Hmm. So it would appear the filmmakers have found a way to make Thanos look even sillier. I thought Thanos looked fantastic in the trailer. They say he is purposefully without his armor because he is so self assured about having the Gauntlet that he doesn't need it! That is a badass design. Love it. A taste of what would have happened if Stan Lee was too successful in his initial Hollywood foray of the 70's. 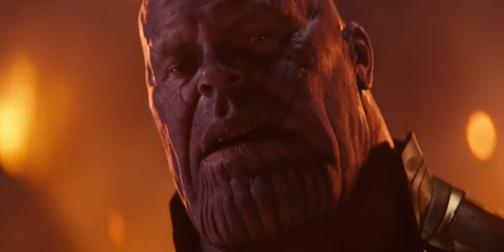 "And the world will never be the same...."
Thanos looks like Darkseid's out of shape brother. Even more crossovers than we are already seeing taking the films the same way as the comics. Whilst I am excited about the up-and-coming Avengers' movies, I fear it is the beginning of the end. And the spectre of past failures will always loom: Spider-Man didn't quite work for me in the MCU. Probably just me. Let's keep the Disney/Fox acquisition discussion to the thread in the main JBF forum, please. Awesome! Now... why can;t ALL these movie releases open on the same date? Jesus, that's next month! How fast can Marvel make these things? With a total global simultaneous worldwide release....I predict Infinity War will break the billion dollar mark FASTER than any film in history. I have a suspicious feeling that it will actually come-up short, behind BLACK PANTHER. INFINITY WAR will be popular for sure, but something tells me BP, by year's-end, will indeed be the King of 2018. I dunno. Unless reviews are decidely bad....IW should get everyone who has been following the MCU to date....AND those folks who went to Black Panther who had no interest in the MCU. If the marketing was smart...there will be a slew of new IW ads featuring Black Panther. And IW is debuting all over the world at the same time! The hype will be global. I have to wonder....are they moving the date forward because early screenings aren't as good as they'd hoped, and they don't want the word to get out too soon, hurting US sales? Nah....that couldn't be it.....could it? I've really liked the MCU movies directed by the Russo Bros. As much as I liked BP, I think IW has more potential. I believe this movie (if done right) is going to be the biggest MCU movie ever. In fact, I think this is going to be the peak of the MCU mountain and nothing they produce will reach this level again. Robert, the article I linked to says the reason for the movie's release date being moved up is to avoid spoilers getting out before the U.S. release (They just now figured that out??). Matt......yeah thats what they say, but is that real reason? There is the story about Sony and the 1998 Godzilla movie. The early pre-screenings were very unfavorable, so Sony actually increased their advertising and marketing in the hopes to get as many people as possible to the opening weekend, because they knew once the word got out, sales would tank. Don't get me wrong, i hope the real reason is exactly what they stated, because if it is, that tells me there is a big big twist in this movie that they want everyone to see for themselves. Very excited about that. I don't buy it. Marvel accelerating the release of a turd bomb for the sake of a mass squeezing of the rubes flies in the face of their demonstrated business practices; if they were willing to let a piece of crap out of the gate, after 17 releases it it would have happened by now. I'm confident, at least as long as Kevin Feige is producing, Marvel will reshoot entire films if they have to, in order to maintain the brand strength. Does everything have to be a conspiracy? Sometimes a banana really is just a banana. Bill, what you wrote is pretty much what is stated in the article for the change to the U.S. release date.